Exactly 24 hours ago, I was appalled at the contents of my Twitter feed. As I scrolled down, my jaw dropped to the floor at the horror and stupidity of what Asda had done. You may have heard about it on the news. 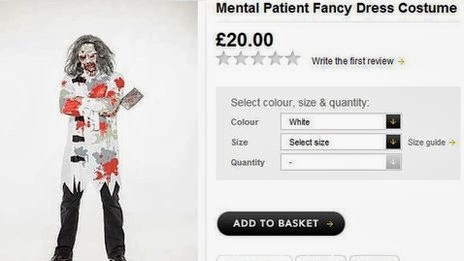 Who on EARTH can be insensitive enough to sell a costume and label it as this? What, exactly, were they trying to achieve? Within minutes of many of my followers and those whom I follow sending Asda some very pleading messages to remove the item from the shelf, they did - phew. It is highly appropriate that they are donating £25,000 to Mind. But perhaps the most important thing they need to do is send their George buyer(s) on some sort of course and give them some sort of understanding on mental illness and the stigma that goes into it. The only good thing that came out of it all was the opportunity for mental health to be talked about on the news - it was even trending on Twitter. And perhaps those who are stupid and ignorant enough to know little about all this, might have learnt how serious this is. Tesco did something as equally as stupid but they don't deserve my time or energy to go into it. Thank you for making sure this doesn't go unseen and unchallenged!